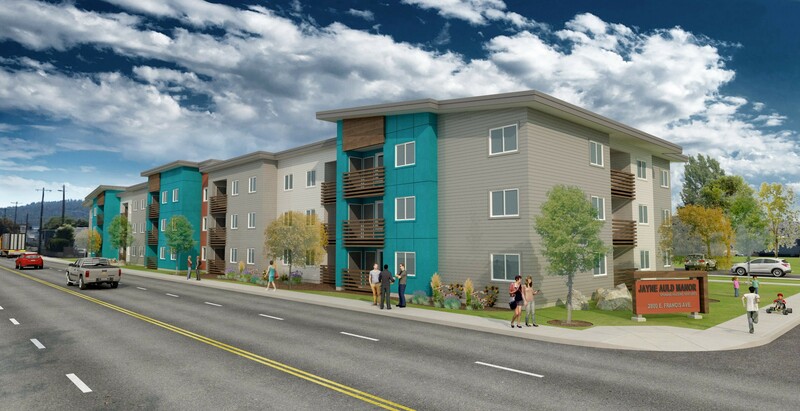 Construction will soon start on a new 48-unit affordable apartment complex in Hillyard aimed in part at housing homeless youth in Spokane, according to nonprofit Spokane Housing Ventures. Workers will break ground in March on the complex, called Jayne Auld Manor, says Fred Peck, executive director of Spokane Housing Ventures. He says Spokane Housing Ventures was inspired to build the complex when he learned there were more than 3,000 homeless youth in the county, according to the definition of homelessness used by schools. "A lot of kids are couchsurfing. Kids don't have stability being in school," Peck says. "So that's what got us moving in this direction." The roughly $10 million apartment complex will be named after Jayne Auld, who helped develop the nonprofit Spokane Housing Ventures and dedicated her life to serving the needs of low-income families. It will be located at 2830 E. Francis near Arlington Elementary School. Residents will consist of workers who earn less than 60 percent of the area's median income, which for a four-person house is around $65,000 per year. Peck says he thinks it will make a "small, but significant dent" in the issue of homeless youth in Spokane. Kilgore Construction will be the general contractor, Peck says. Spokane Housing Ventures also plans to build several duplexes next to Jayne Auld Manor that are dedicated to housing homeless veterans. The nonprofit announced last month that it was awarded $400,000 for those 10 units, but more funding will be needed to complete the project, says Dave Roberts, senior developer for Spokane Housing Ventures. "This is just the start of these projects," Roberts says.